More Valentine's design: Claesson Koivisto Rune presented this chair with a heart-shaped back at Stockholm Furniture Fair last week. 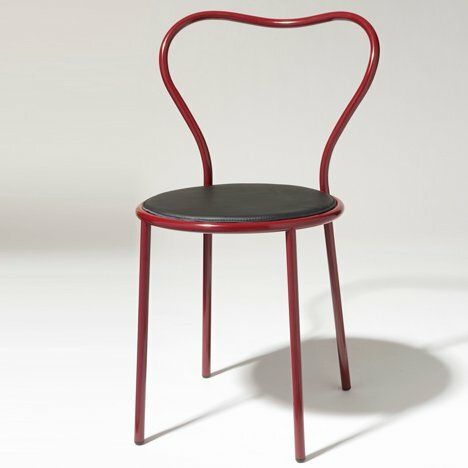 The product for David Design is made of bent tubular steel with an optional upholstered seat pad. It's part of the Atelier Collection, David Design's first series since it came under new management, which also includes pieces by Inga Sempé, Luca Nichetto, Benjamin Hubert and Staffan Holm. See all our stories about Stockholm Furniture Fair here and all our stories about Claesson Koivisto Rune here. Also on Dezeen this Valentine's day: love-struck paperclips by Lee Washington.